The chassis is made of 3mm aluminum plates except for the front panel witch is 12mm. The sinks are rated at 0.3 C/W and the temperature stabilizes at a little over 60 degrees Celsius. 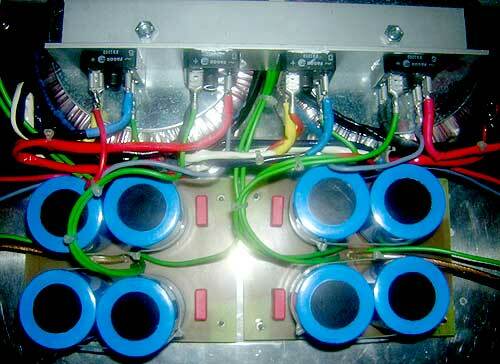 The power supply consists of 2x18V 400VA X 2 toroid, and 8x22000 mf BC capacitors. Rail voltage under load is +/-23.5V. DC offset is less than 35mV. My amp uses 4 IRFP240 per channel. Bias is about 1.67A per channel with the resistor values given in the schematic. Having listened to the amplifier for a few months, I find it to be very musical. Compared to my NAIM HAFLER and AMPZILLA amplifier, music on the A3 seems more three-dimensional, with the midrange and treble taking on greater clarity and delicacy. I'm grateful to Mr. Pass for sharing with us his wonderful designs and his tremendous support to the DIY community. And many thanks to Mr. Pass and the other members of diyaudio.com who provided much technical guidance, inspiration and encouragement. Nick.